In the previous lesson, I showed you how changing pentatonic scale can help you connect to minor key chords in different ways. In this lesson, we're going to look at how to play through another common minor key sequence called 2 5 1 (or ii V i). By practicing playing through this sequence, you'll improve your skills with changing scale as the chord changes - a skill that will really connect your lead playing to the music and give you more control over defining the chord quality. In minor keys, the 2 chord is diminished or, more commonly a m7b5 chord, sometimes rather ambiguously referred to as a half diminished seventh chord. We can visualise the 2 chord root as a whole step or 2 frets up from the tonic root. So in the key of Am, the 2 chord would be B diminished or Bm7b5. A - B = whole step. Nearly always, the 2 chord will move to the dominant 7th 5 chord, E7 in this key and then resolve to the minor tonic, giving us a 2 5 1 cadence. Over the 2 chord, minor pentatonic in the tonic position would do the job in most cases. So over Bm7b5, A minor pentatonic would be our stock choice. But there's an alternative which we can use to really bring out the diminished flavour of the 2 chord. Over the 2 chord, all we need to do is raise the 3 of that pattern by one fret/semitone. This gives us a diminished pentatonic scale we can use over the 2 chord. Like previous pentatonic scales we looked at, both these 2 chord pentatonic options can be seen as derived from natural minor in the tonic position (so A natural minor in this key), since a diminished, and by extension, m7b5 chord naturally occurs on its 2nd degree. Practice your Bm7b5 scale phrasing over the backing tracks below - one in a jazz style, the other with strummed open chords. They both cycle through a 2 5 1 sequence in A minor, but for the moment just focus on that 2 chord. Let's now move to the 5 chord. In the previous part, we learned a pentatonic scale that works well over the V chord in most situations, and give it a little tension. But there are variatons to consider, depending on the chord flavour we want to imply. In jazz and blues, for example, the V chord is often extended to a 9th chord. This is where we add a 9th (the equivalent of a 2 in scale terms) to the regular dominant 7th chord. This 9th can be natural, or altered in the form of a sharp or flat 9th. Now, unlike the more tense dominant sound we covered before, this natural 9th gives the V chord a sweeter sound. This actually has quite a haunting sound, because we're moving from the dark tension of the diminished 2 chord to a strangely bright and relaxed 5 chord, when most ears are expecting the tension to continue. That unpredictable contrast adds some musical interest. To bring out that #9 flavour, all we need to do is play minor pentatonic on the 1 position. That means we don't even have to change our tonic minor pentatonic scale! So A minor pentatonic would work in the key of A minor, as it perfectly complements the bluesy sound of the #9 V chord. And what about a b9 (flat 9) dominant? Well, this was covered by our altered dominant pentatonic scale from the previous part. Side note: This is how to think about scales - as connected to the chords you're playing over. 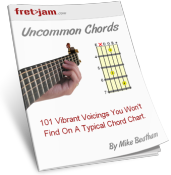 You can bring out certain chord qualities in the tones you select for your solos. So if, for example, the 5 chord was just a standard dominant 7th chord (e.g. E7), YOU choose how you extend that chord, the overall flavour of that chord, by the tones you play in your solo. Jazz musicians refer to this as the chord-scale system - matching several possible scales to their base chord. Same tracks we used with the 2 chord. This time, try playing through both the 2 and 5 chords, and apply the 5 chord options from above. Remember, YOU choose how you colour these chords as I've left out extensions such as the 9th (they're just basic 7th chords). Note that the #9 / minor pentatonic colour works best in a jazz context! Over the tonic minor chord, minor pentatonic would of course be our standard choice. But we can use a similar method of changing scales to highlight different chord qualities. This gives us a 9th flavour (e.g. Am9), because of the 2 in the scale (the 9 and 2 are basically the same tone). Or we could highlight the chord tones of an extended minor 6th chord for something a bit jazzier. By omitting the 1 from the scale, and introducing a major 7th, we get more of an "outside" sound over the tonic. This is straight out of the melodic minor scale, and a common resolving tonic in jazz music. Now we can try playing through the full 2 5 1 sequence! Along with the acoustic track, there are two jazz tracks - one resolves to Am7, the other to Am6. The Am6 track will be best suited for the minor 6th scale above. All in all, we've seen and heard how there are several options available to us for using pentatonics in minor keys. The beauty of pentatonic scales is that they act as extended arpeggios, since we're only adding two colour tones to the triad tones. This gives pentatonic scales a very direct connection to the chords we're playing over, and a good place to start with building musical phrases. I hope you enjoyed this journey!